Fradique de Menezes is the current President of Sao Tome and Principe. He assumed power in 2001 and is the country's third president. 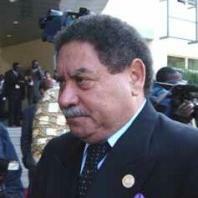 Fradique de Menezes (born March 21, 1942) has been the President of São Tomé and Príncipe since 2001. Mr. De Menezes is the country's third president, after Miguel Trovoada, who served two five-year terms, the maximum permitted by the constitution (1990-2001) and Pinto da Costa (1975-1991). Fradique de Menezes was born on the then Portuguese colony of São Tomé in 1942, the son of a Portuguese man and a local woman. He attended high school in Portugal, and then studied Education and Psychology at the Free University of Brussels. He was foreign minister of São Tome and Príncipe from 1986 until 1987. Menezes, a successful cocao exporter, was elected President in 2001, defeating Manuel Pinto da Costa. Menezes took office on September 3, 2001. His eligibility as a candidate was questioned, since he also held Portuguese citizenship, but he renounced this and his candidacy was approved. On July 16, 2003, while he was away in Nigeria, there was a military coup d'etat led by Fernando Pereira. Mr De Menezes returned to Sao Tome in July, 2003, after an agreement to restore democratic rule was reached with the coup leaders. Menezes was re-elected on July 30, 2006, winning 60.58% of the vote and defeating Patrice Trovoada, son of former president Miguel Trovoada. In February 2008, however, Menezes entered a power-sharing deal with the opposition Independent Democratic Action (ADI) party led by Patrice Trovoada, who then became prime minister. The president wants revenues from new offshore oil fields to be used to improve public services. He is keen to reduce Sao Tome's isolation and favours stronger ties with West Africa.